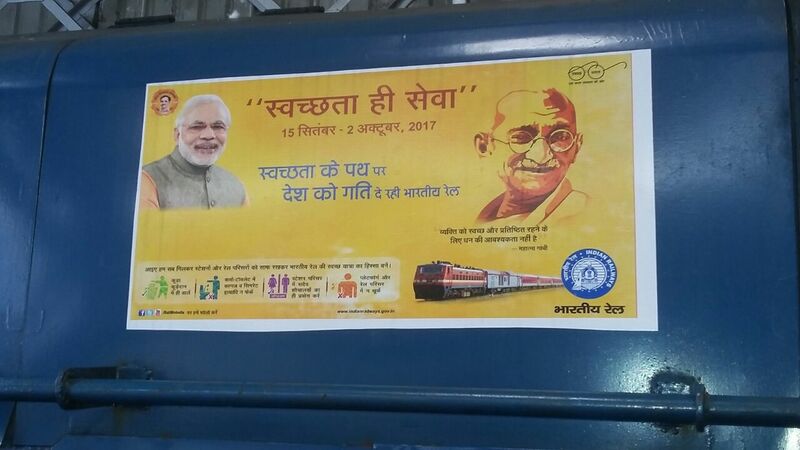 a)For improvement in cleanliness and passenger amenities on DEMU coaches. 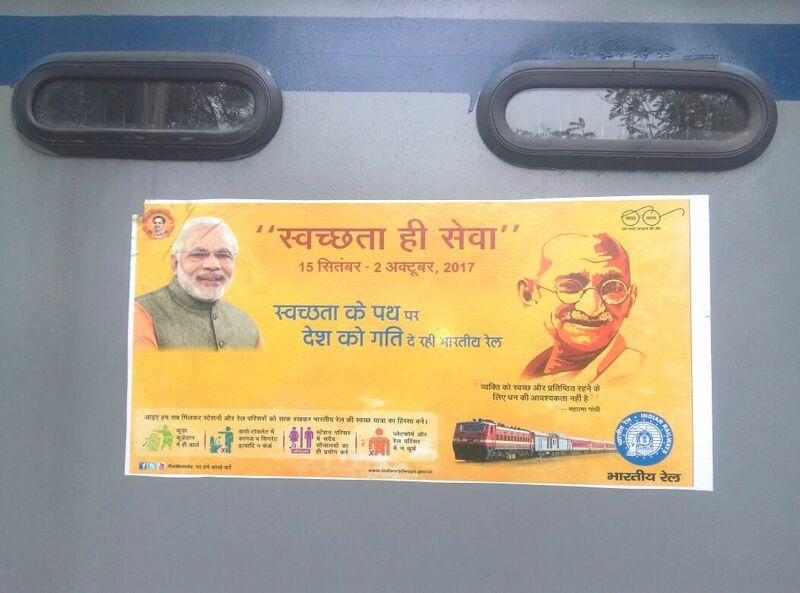 c)Monsoon precautions – for improving loco reliability. d)Summer precautions – for improving loco reliability. e)For ensuring brake power on diesel locos. Pressurization of cooling water system on WDP1/WDM2 locomotives are used primarily to reduce incidence of hot engine alarm. The pressurization of cooling water system will increase the boiling point of the cooling water. This in turn permits high engine operating temperatures, with a minimum loss of coolant due to boiling point increase. Pressurization also ensures a uniform water flow, minimizes the possibility of water pump cavitations during transient high temperature condition. Pressure cap which is located on the water tank opens at 7 psi (0.5kg/cm2) and relives excessive pressure, this prevents damage of cooling system components. After release of excessive pressure it will come to normal working position. For checking the working condition of pressure cap, Diesel shed BZA has developed a Gadget with in-house facilities. 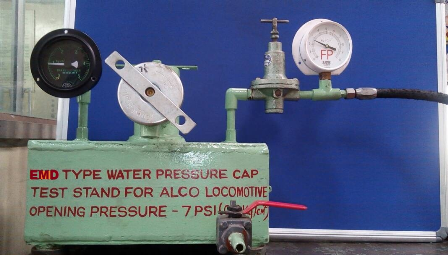 With this gadget, the pressure cap working condition can be checked before fitment on locomotive and also to check the caps running on locomotive during major schedules. The new HHP 1400/1600HP DEMU DPCs Bolster suspension is taken care by Air springs instead of helical coil springs. 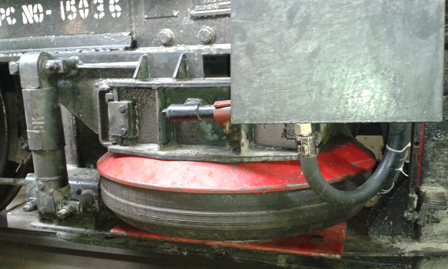 Earlier in 1400HP DPCs i.e, 15035, 15036 & 15038 were provided with 150KN round base springs. At present round base air springs production was stopped. Due to non-availability of 150KN round base air springs, 180KN air springs with high capacity rectangular base were provided for the new HHP 1400/1600HP DPCs for better suspension and high load carrying capacity. To improve better reliability of DPCs 15035, 15036 & 15038 has been taken up to modify with high capacity 180KN rectangular base Air springs. While carrying out the modification work, four additional holes are provided on the base for fitment of rectangular base air springs. The 180KN air spring is slightly larger in size when compared to 150KN air spring, causing obstruction to the air hose adopter which supplies air to the reservoir of air spring. So the pipeline feeding air reservoir has been dummied and in place of it, one additional hose pipe line has been provided for feeding air to the reservoir and additional safety clamps are also provided for arresting vibrations. So far DPC 15036 is completed inducted in the service and balance will be completed by end of June 2017. 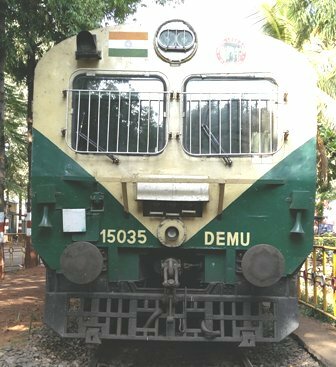 1600HP DEMU DPCs had been received from ICF and commissioned in the year 2016 at DLS/BZA. The fuel filling pipe line had some problem for fueling due to 90° bend at start of pipe line. In turn this bend causes fuel filling pipe touch the body of DPC, and further obstructing of fuel oil pipe resulted delay in fueling at platforms/stations. To overcome the above problem, shed made a modification in-house by changing elbow assembly 90° to 120° and accordingly vertical and horizontal dimensions modified. By incorporating above modification, the fueling is being done at the rate of 4 minutes /1000 liters and no delay observed on account of fueling. So far, 3 DPC Nos. 15077, 11128 & 11129 completed and balance 3 DPCs will be completed by end of July 2017. 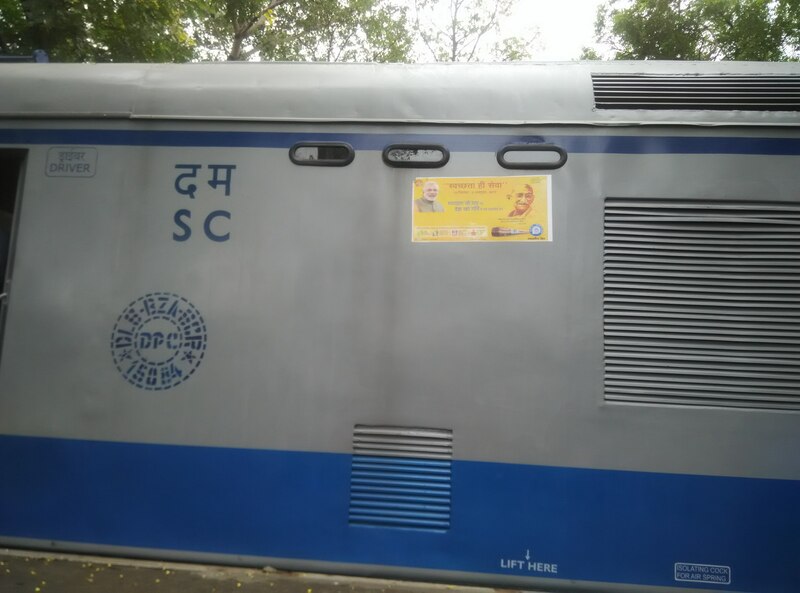 1600HP DEMU DPC No.15080 had been received from ICF and commissioned on 18.03.2017 at DLS/BZA. The Air bleed valve is located between the Fuel Pump Pressurized assembly and the fuel return line junction block. This Air bleed valve develops pressure up to 7.5Kg/cm2 before cranking and then only allows cranking the engine. While running the engine the air bleed valve got directed and failed to maintain 7.5kg/cm2 pressure and so engine got shut down and engine not cranked further. There is no spare Air bleed valve available in shed. 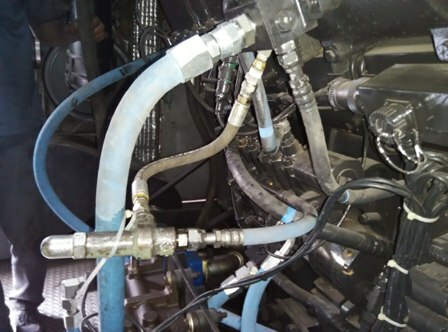 To overcome the above problem, shed has modified with the available fuel oil relief valve of WDP1 locomotive was set at a pressure of 7.5 kg/cm2 and provided in DPC 15080 in place of defective air bleed valve and working satisfactorily. This was avoided grounding of the DPC. DPC’s are provided with cab light of conventional type with 110V/40watts incandescent bulb and work when DPC is in cranking condition and there is no provision of dim light. Loco pilots are facing much problem in the night due to brightness not able to observe signals clearly since cab light focus and Loco Pilots are switching ‘OFF’ cab light and putting ‘ON’ whenever required and not able to keep on continuously. By modification of cab light to LED with dim and bright provision with two way switch in front of the Loco pilot on the control desk. Loco Pilot need not required to put-off cab light and he can keep in dim also. 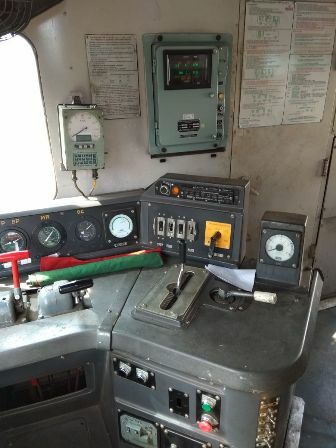 Loco Pilot can have sufficient lighting in the cab even in running he will have clear vision on signal. Technically the power consumption is very low and frequent fusing of bulb and replacement is avoided there by attention of staff not required which will save manpower and cost of bulb. The LED is one time replacement and lists long in service. So far 6 DPCs modification completed and balance will be carried out by end of Nov.17. 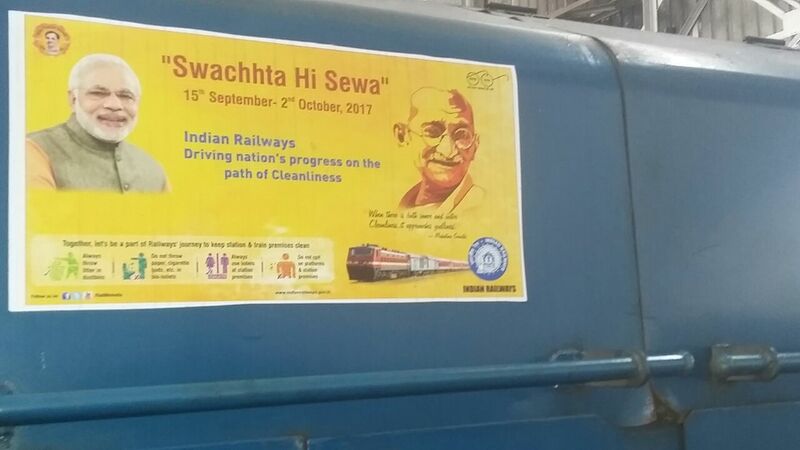 In view of Celebration of 3rd Anniversary of “Swachha Bharat” from 15th September to 2nd October 2017, Diesel Loco Shed, Vijayawada has been pasted “Swachhta Hi Seva” stickers in Hindi & English languages on all 16 WDP1 and 50 DEMU DPCs homing at DLS/BZA completed. 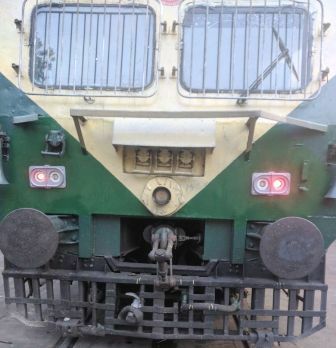 DEMU 700/1400HP conventional type DPC are provided with tail light blinking type at the center of the DPC in between the buffer in red colour ONLY if tail light failed there is no indication to the last vehicle identification or to the train coming in opposite direction of Loco pilot. While the train is working as leading DPC, if Head light failed there is no indication to proceed with restricted speed except tail light. To overcome this problem, shed is modified the DPCs and are provided with two marker lights on both sides of the driver cab in front with one white LED light on both sides and red LED on both sides which glows directly from battery supply even though control battery isolating switch is in off condition. 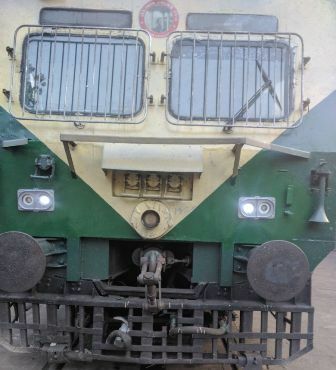 If Head light failed in leading DPC while working Loco pilot can work with white marker lights on both sides with restricted speed which avoid failure. So far nine DPC are modified remaining DPC material indented will be completed as soon as material received. Diesel Loco Shed, Vijayawada is homed with 16 WDP1 locomotives out of which three Locos i.e., 15061, 15028 & 15069 were rebuilt done at DLMW Patiala. While rebuilding, the locomotives memory type speed recorder and indicator removed and provided with analog speed indicators on both control stand and memory inbuilt in MEP. Loco Pilots while working on these locomotives are complaining that the speed indicators are showing wrong indication since there is no digital indication and only analog type is available. Digital available in MEP display unit which is behind the Loco pilot. This problem was apprised to Dy.CME/DLMW/Patiala and further not to remove existing speed recorder and indicator in future rebuilt locos. In the Meantime the speed recorder and indicator of M/s Medha make of 918 model removed from condemned over aged WDM2 locos has been taken up and provided in three WDP1 locos. Diesel Loco Shed, Vijayawada is homing 24 DEMU 700HP DPCs, out of which 17 DPCs are equipped with CAT & 7 DPCs are equipped with CIL make engines and the Power rotating machines are provided with 3 DPCs of NGEF Traction Alternators i.e., DPC Nos.14001, 14009 & 14029. The NGEF make spares have stopped supplying due to closure of the product. Since the non-availability of spares of NGEF make Traction Alternators causing anxiety for day to day maintenance. To overcome the problem, the shed has taken up to replace Traction alternators from NGEF to BHEL in a phased manner. Apart from, for the first phase, DPC No.14001 has been taken to replace from NGEF to BHEL Traction Alternator with in-house facilities. 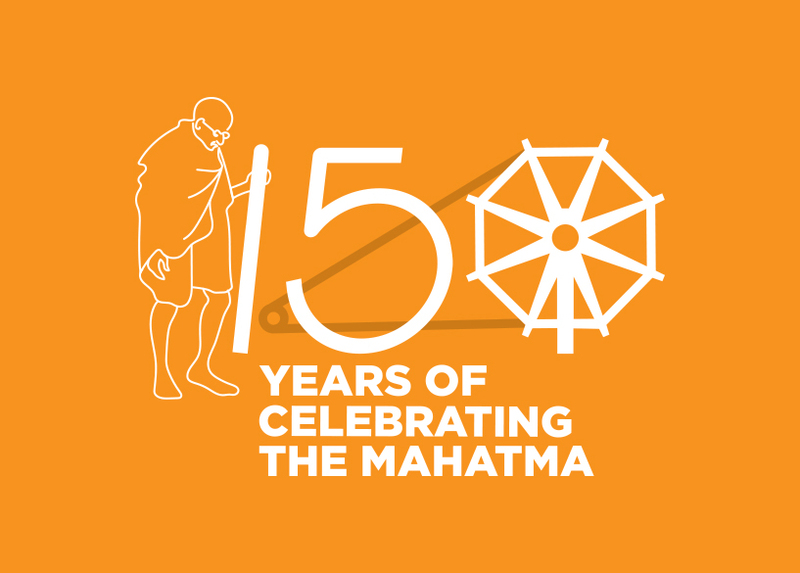 During the modification, utmost care taken to the Main engine chassis and foundation work is carried out to suit BHEL Traction Alternator and alignment. All systems of water, air, lube oil, fuel oil and hydraulic systems are modified suitably with necessary pipeline brackets and secured correctly. The work completed in 20 working days and load box test also done. All parameters checked and found satisfactory. Five WDS6AD shunting locomotives (6 cylinders) supplied by DLMW/PTA and commissioned during 2016 in DLS/BZA. These shunting locomotives are being utilized in Yard shunting, Coaching shunting & RYP yard shunting in BZA division. These locomotives have been provided with Crank Case Exhaust Motor (CCEM) to take out exhaust gases from engine crankcase. Normally in other “ALCO” locomotives there is a drain pipe from crankcase exhauster pipe of CCEM to drain any lube oil carried out by exhaust gases. But in WDS6 locomotives this drain pipe provision has not been provided and it causing accumulation of lube oil in CCEM and same is oozing out from CCEM. In turn, for WDS6 locomotives CCEM exhaust hose pipe of length 42” to DLW part No.11272715 is being used, unlike WDM2/WDP1/WDM3A locos for which 18” length hose pipe is only used. The 42” hose is causing over hanging and the pipe is getting damaged frequently due to twist and requires frequent replacement. 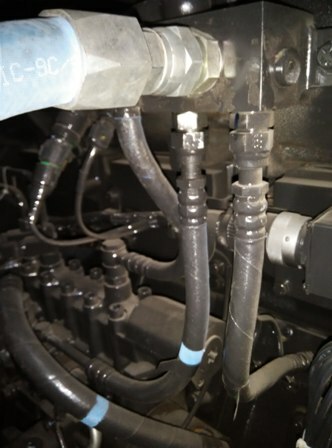 To avoid above problems, DLS/BZA has modified the CCEM exhauster pipe line and drain pipe provision is made and this drain pipe connected to engine inspection door as this locomotive is not having left side cam gear cover like WDM2/WDP1/WDM3A locos. Further, with this modification CCEM exhauster hose pipe to PL.No.112722703 of length 18” only of WDM2/WDP1/WDM3A (i.e., of 16 cylinder engine) can be used. At present auxiliaries unloaded for overhauling from ALCO Locomotives and DEMU DPCs and after overhauling are stacking on the horizontal Iron benches. The iron benches are occupying more ground space and facing difficulty with available less working space causing unhealthy and unsafe working. To overcome the above problem, the available and the material assistance from CWM/RYPS, one three stair vertical auxiliaries like Auxiliary Generator/Exciter, Auxiliary Alternator and Eddy current clutches stand for accommodating four auxiliaries, two ECC and two auxiliary alternators in a row fabricated in house. This increased the free space for working, healthy and safe working environment for the overhauling staff of Auxiliaries Section. At present Traction motors are being unloaded for overhauling from ALCO Locomotives and DEMU DPCs and after overhauling are stacking on the horizontal Iron benches. The iron benches are occupying more ground space and facing difficulty with available less working space causing unhealthy and unsafe working. To overcome the above problem the available and material assistance from CWM/RYPS one three stair vertical traction motor stand for accommodating 9 motors fabricated in house. This increased the free space for working, healthy and safe working environment for the overhauling staff of Traction motors Section. At present traction motor yoke and armatures are keeping on engineering Gribs to clean before and after dismantling. The mud and cardium compound falling on the ground while scraping the yoke body and armature bearings and making environment dirty and slippery. To eliminate the problem a tray made with MS sheet welded to an iron stand for accommodating two yokes or two armatures at a time and the mud and cardium collected on the tray will be taken out and disposed to nominated location for further disposal which made environment neat and clean.